I am living in Holland which is also called The Netherlands. 'Nether' meaning 'low' . In French it is Pays Bas = Land Low. Indeed we are the Low Country. I am living about 12 kms east of Rotterdam in a small suburban town called Krimpen a/d IJssel. The 'height' of my location is -2,1 meters.... So that checks out with low! On the other side of the river IJssel is the much bigger town of Capelle a/d IJssel and a part of that town is even at -9 meters below sea level. We are a small country but we tend to compensate that with, a big mouth, having an opinion on almost anything and also ventilating that loudly to the world. Otherwise we have done some remarkable things not only long ago, but also these days. For instance close to 1600 the Dutch founded the first multi national company ever (Vereenigde Oostindische Compagnie = United East Indian Company or short: VOC) We also had a number of famous painters as Rembrandt, van Gogh, Rubens and many others. Not a medieval but a more recent example. The painter was Leickert (1816-1907). 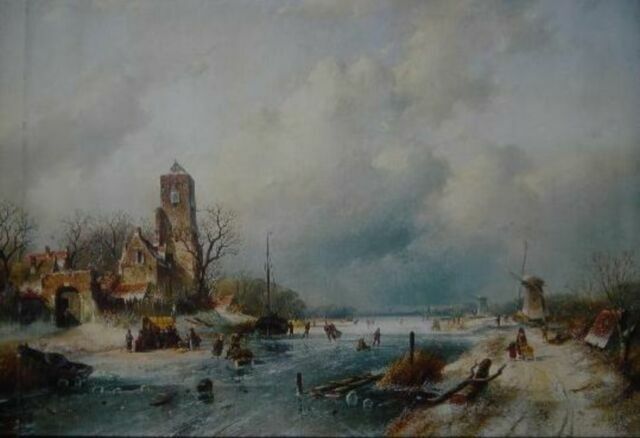 The painting is representing a Dutch winter scene. Skating always has been a favourite passtime in my country. Things have not changed too much. 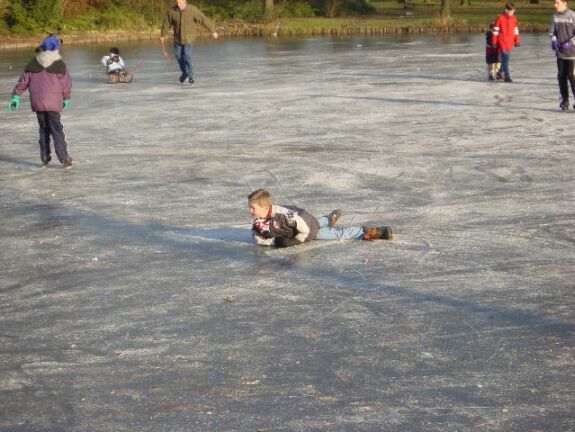 This picture, featuring my grandson Vincent (5) resting on the ice of the small lake in front of our house, was taken on December 21, 2001. Try out one or more of the buttons to the left. As this is a newly built web site, you will find that not every item has content... yet. Trying to make it bi-lingual is another time consuming business. But I keep ploughing on between all the other scores I have.